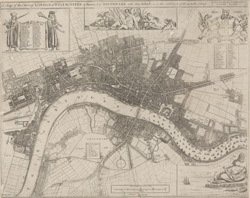 The title of this map of London, Westminster and Southwark appears along the top, with a reference table (flanked by sword and mace-bearer) at top left, a figure of Mercury (with the city arms on his shield) at top centre, and a second reference table below city arms at top right. The key to places in Southwark appear in a table at St. George's Fields, with compass star and scale bar at bottom centre and an allegorical figure of Father Thames at bottom right. John Oliver first issued this map in 1680. This is a later edition published and sold by John Bowles from his shop at the Black Horse in Cornhill.